Change control is used in Application Designer to lock definitions and track the history of changes to definitions. This shouldn't be mistaken with version control, it is simply a mechanism for indicating that particular developer is working on a particular definition and to keep a history of who has modified a particular definition and why. 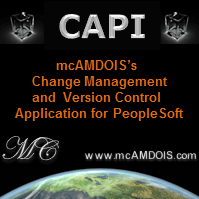 Generally you will want change control activated in your master development environment. Once change control locking and history are turned on, you'll also have the ability to lock all definitions through change control administrator. Depending on your version of PeopleTools, locking and unlocking definitions may not be quite that intuitive. Sometimes these two ways just don't seem to work (in particular on Application Packages!). In that case, you need to find who has the object locked (you can find this out by opening the object and reading the message dialog). Then navigate to Tools -> Change Control -> View Locked Definitions. Specify the definition type, and then the user. Right click on the definition you want to unlock and select Unlock Object.